Fluoride rinsesare one of the many ways fluoride can be delivered to our teeth to prevent cavities. Studies on fluoride rinses have been made and in general, fluoride rinses resulted in significant cavities reduction of about 30 to 35%. On the basis of these findings, the simplicity of administration, and the lack of need for professional dental supervision, weekly fluoride-rinse programs in schools are becoming increasingly popular and are being aggressively promoted by dental public-health agencies. Fluoride rinses were approved as safe and effective by the FDA in 1974 and by the Council of Dental Therapeutics of the ADA in 1975.
an indication that the preparations should not be used by children younger than 6 years of age. At present there are several fluoride rinses distributed in this manner; these products contain about 225 ppm fluoride and are intended for daily usage. Who should use fluoride rinses? Individuals who, because of the use of medication, surgery, radiotherapy, and so on, have reduced salivation and increased tooth decay formation. 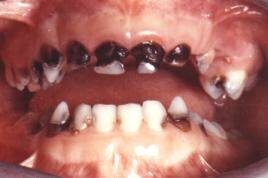 Individuals with orthodontic appliances or removable prostheses, which act as traps for plaque accumulation. Individuals unable to achieve acceptable oral hygiene. Individuals with extensive oral rehabilitation and multiple restorative margins, which represent sites of high cavities risk. Individuals needing fluoride in their home care but cannot tolerate a custom-fitted tray. Individuals with gum recession and susceptibility to root cavities. Individuals with rampant cavities, at least as long as the high tooth decay activity persists. As a general rule, daily rinses should be recommended rather than a weekly regimen; not only does the daily procedure appear to be slightly more effective, but, as a practical consideration, it is easier for individuals to remember and comply with a daily procedure. In all these instances, it is important to remember that the rinses should not be used in place of any of the other modalities of fluoride use but as part of a comprehensive, preventive program that should also comprise plaque control, frequent fluoride topical applications, the home use of a fluoride dentifrice, diet control, and testing to determine if and when the oral environment is no longer conducive to cavities. For children living in non-fluoridated areas, the prescription of fluoride supplements may also be considered. Before using a fluoride rinse, brush your teeth. Though fluoride rinse may help to prevent cavities, toothbrushing is still an important part of our oral hygiene regime. 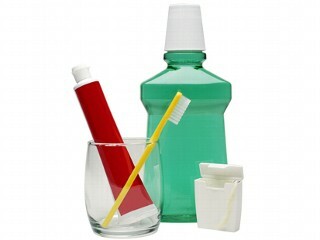 Brush for at least 2 minutes, spit out the toothpaste and rinse your mouth with water. Flossing is the next step after tooth brushing. Clean in between every single tooth, moving the floss back and forth to dislodge any food particles. 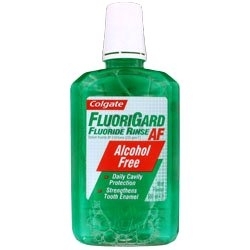 Rinse your mouth with fluoride solution. A capful should be sufficient or follow the instructions provided. Swish the rinse around the mouth to make sure it reaches every tooth. Make sure you DO NOT SWALLOW the rinse. Do this for at least 30 seconds. Spit the fluoride out and do not rinse your mouth with water as it will weaken the effects of the rinse. Do not eat or drink anything for 30 minutes after the rinse.